All new hickory hardwood floors, a combination of dark gray stained hickory and white cabinets. 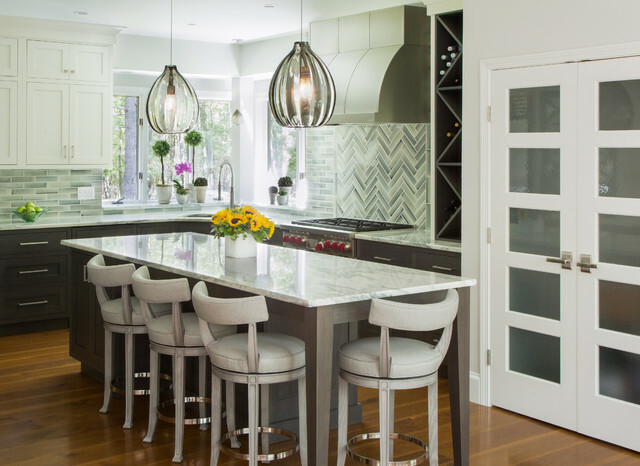 Handmade backsplash tile in a herringbone pattern and custom stainless steel range hood are the main features of kitchen. The doors are from Simpson and the hardware is Emtek. light fixtures? - Love them! Where are they from? These fixtures are from Tech lighting, love them too! !